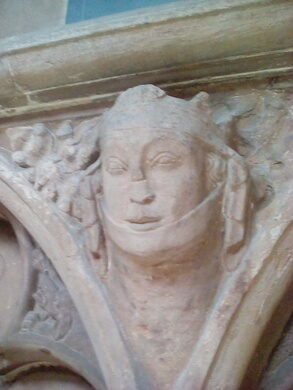 These medieval carvings bear scars left by Parliamentarian troops during the English Civil War. This fine medieval cathedral in Lichfield, England, houses some fantastic examples of stone carvings. But unfortunately, some of the most interesting ones bear scars from the English Civil War. England's most notorious suicide spot. Lichfield was a highly besiege city during the 17th-century conflict. Its cathedral was occupied at times by both Royalist (“Cavaliers”) and Parliamentarian (“Roundhead”) troops, as its defensive walls made it a suitable fortress. The Parliamentarians were generally of the Puritan faith and had no regard for ornate church carvings, which they considered examples of idolatry (worship of idols). 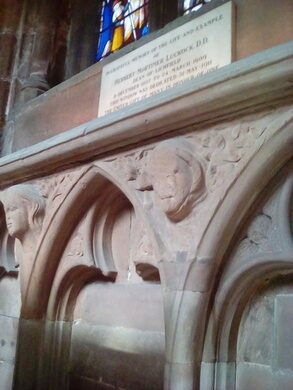 While they didn’t destroy all the carvings in Lichfield Cathedral as they did in other churches, their disdain for the decor can be seen on some of the carved faces. Roundhead soldiers used the carvings as sharpening stones when looking to put an edge to their swords and other bladed weapons. Look at the faces around head-height near the front of the left (north) side of the cathedral, and you’ll see marks of the Parliamentarians’ presence. One stone is clearly scarred by wear marks across the cheek, brow, and bridge of the nose. If you look carefully, you can see others where swords were repeatedly sharpened by drawing the blades’ edges along the carvings’ lips, etching an unusually straight line across their mouths. 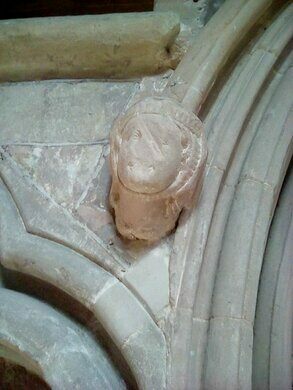 You’ll also note that some of the stone carvings look almost pristine. These are from the restorations that took place during the Victorian period. Entry is free but donations are requested. It's open Monday through Saturday from 9:30 a.m. to 6:15 p.m. and Sunday from 12:30 a.m. to 5:00 p.m. This is the only three-spired medieval cathedral in England and is well worth a visit in its own right. Look out for the fine memorial to the Staffordshire Yeomanry Regiment, the fantastic vaulted ceiling, and the memorial to Erasmus Darwin. Look also for the stained glass imported from a Belgian Abbey in the early 19th century. A long-overdue monument to the forgotten British men drafted into the coal mines during World War II. A giant gleaming memorial named for a coal miner who gave his life to the pits. In an arboretum with hundreds of memorials to the fallen, this one might be the most poignant.